Disney Store Winnie The Pooh Hoodie. Condition is Used. Shipped with USPS Priority Mail. Women’s size medium. Only worn a few times and shows no signs of wear. 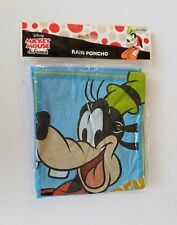 Disney Mickey Mouse & Friends Hooded Rain Poncho. Features Goofy's head with yellow and blue border and "GOOFY" displayed on blue background. Adult Poncho. One Size Fits All (Fits Most Adults). Snuggly and sooo soft! Disney hooded fleece jacket featuring embroidered dwarf Grumpy. Unisex adult size XXL. This DISNEY MICKEY MOUSE VARSITY JACKET can be worn equally by a man or a woman. It is an Extra Large. This Jacket is in excellent condition. There are no tears, stains, missing buttons or frayed edges. NWT fresh from the race. Inventory - W7. Total length of sweatshirt: 26”. Size: Large. Disney Store Winnie The Pooh Varsity Jean Jacket Khaki Denim Vtg Size XL top button needs repair . Condition is Used. Shipped with USPS Priority Mail. 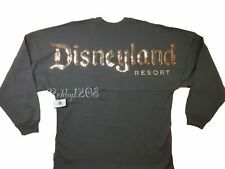 Disneyland Resort Mickey Mouse Jacket with hood and light gray lining. Jacket is in used condition. Zippers have paint loss. Size - Large. Weather resistant Mickey Mouse Jacket Pit to pit: 28". Zippers and drawstrings all work great. Minor stain near the second to last button on the front (see pics). Otherwise in great condition. On the lower back it states "and they lived Happily Ever After - The End". 95% cotton/5% Spandex. I hope you enjoy my quality preowned unique clothing that I find. DISNEY Parks Authentic Mickey’s Very Merry Christmas Party holiday cheer is here! magic kingdom mickey adult M long sleeve Light weight hooded sweatshirt 2018 T-shirt retail $40 New w tag Condition is New. Shipped with USPS First Class Package. Rare Disney Cruise Line Inaugural Voyage Hoodie Large Woman's. Small stains on right sleeve. Please see pictures for condition and sizes. Free shipping and free Returns. Bomber Jacket. Featuring Mickey Mouse honoring the 1971 opening date of the park. Brown leather with red ribbed cuffs and waistband. Zipper closure. Two external and three internal pockets. Chest is 60", sleeve is 25.5", back length is 28". Size unknown, tags have been removed. Please refer to photos for more details. Any further questions please message us! Inside of jacket a name is written in black marker but it is faded. Jacket is very adorable, has Mickey Buttons down the front with 2 flap chest pockets. A velvet Mickey patch is above one of the pockets. ‘Mickey & Co.’ is embroidered on the bottom of the jacket in red. A large Mickey is on the back, it is cracked throughout but it really adds to the vintage distressed coolness of Jean Jacket. Green in color with gold tone buttons. Gray cotton blend full zip hoodie in good condition. Size large armpit to armpit 22.5”, length 22.5” and sleeves 21”5”. I always try my best to make things right if you have an issue. ~FANTASTIC NEW TINKER BELL BEAUTY ROSE WIDE SHOELACES~. This gorgeous pair of black shoelaces features an all over pattern of roses with a "beauty" banner and TINKER BELL resting between the roses. They are about 36" long and 3/4" wide. Features Minnie and Mickey Mouse, Donald Duck and nephews, Daisy Duck, Goofy and Pluto. Mickey Mouse Buttons. Light blue wash. Waist 19" flat lay. Center back neck to hem 24.5". Missing last snap and small hole where snap was. Men’s vintage Tigger varsity jacket Size large Green with grey sleeves Tons of embroidery on the front, sleeves, and back Absolutely insane Tigger piece! Length 27 in. Chest 24 in. Item in pictures is the item you will receive. Very good condition. No holes, stains or tears. BNWT Disney DLR Disneyland Resort Dark Green Enchanted Tiki Room Birds Spirit Jersey Small S.
Small tear on top of zipper (see photos).